Prone is an evening-length work for three dancers, choreographed by John Jasperse with a commissioned score performed live by composer Zeena Parkins. The project is performed in a space co-habitated by the public and the dancers; the audience alternates between lying on the floor amid the dancers and sitting in chairs surrounding the performance space. The structure of the work gives each audience member the opportunity to experience both perspectives. A fundamental conceptual concern in Prone is the examination of the interrelationship between the nature of these two vantage points. The voyeuristic or external vision of the seated audience member implies not only a spatial but an assumed ideological separation between the viewer and the viewed. Their primary means of experiencing the dance is through an external vision, much as a surveyor would take in a landscape that remains physically separate from him. The lying audience member, on the other hand, has an experientially based understanding of the work which relies prominently on senses other than solely vision. Their physical placement inside what is normally considered the dance performance space forces them to, at times, become the subject of other audience members’ vision. Vibrations, shadows, sensations of proximity and peripheral vision combine to heighten the array of senses activated in perceiving the dance. The piece highlights the fact that there are constantly aspects of the work that some audience members perceive which others are not privy to. Prone is one in a series of works by Jasperse that probe the very mechanics of perception. What constitutes engagement on the part of an audience member? How does one create a structure, which implicates the audience experientially as an integral part in the phenomenon of exchange, within the frame of a dance performance? In Prone, the audience is invited to examine not only the dance event itself, but also their perceptual means of experiencing it and ultimately, how they understand their surroundings after they leave the theater. Jasperse firmly believes that this line of questioning can be applied equally to how we understand both the aesthetic and political worlds in which we live. Co-commissioning partners include The Kitchen (New York, NY), The Irish International Dance Festival (Dublin, Ireland), and TanzQuartier Wein (Vienna, Austria). Prone premiered at The Kitchen in December 2005. The music for Prone was commissioned by the American Music Center Live Music for Dance Program. 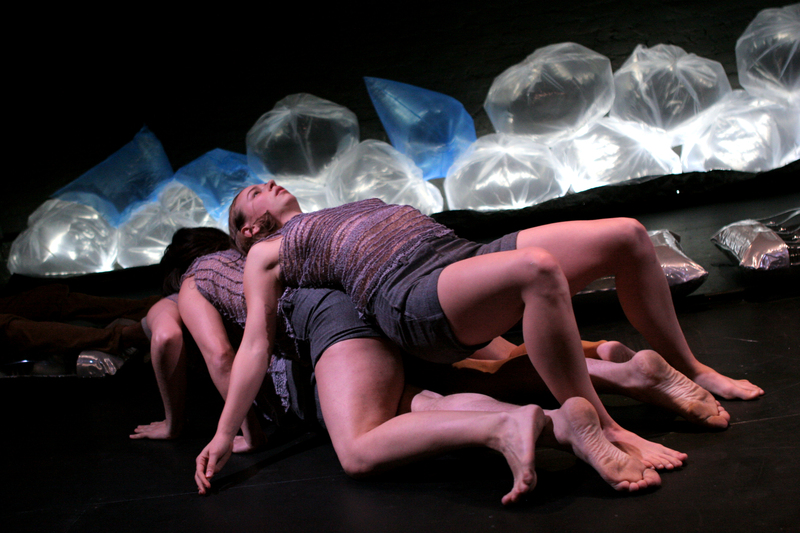 Prone was supported in part by funding from the Bossak-Heilbron Charitable Foundation, The Harkness Foundation for Dance, the Multi-Arts Production Fund, a program of Creative Capital supported by the Rockefeller Foundation, the National Endowment for the Arts, and the James E. Robison Foundation. Funded in part through Meet The Composer’s Creative Connection’s Program. Prone was made possible by the Doris Duke Fund for Dance of the National Dance Project, a program administered by the New England Foundation for the Arts with funding from the National Endowment for the Arts, the Doris Duke Charitable Foundation, and the Ford Foundation. Developmental residencies for the project were supported by Association Chapitre II at the Centre Chorégraphique National de Franche-Comté à Belfort and Le Pacifique in Grenoble, as well as by Thin Man Dance, Inc. at the Baryshnikov Arts Center and Hollins University. Association Chapitre II received the support of the Ministère de la Culture et de la Communication/DRAC Rhône-Alpes in 2003 and 2004.